India’s first bullet train – a dream project for the country – is set to see the light of the day this week. Not just that, if Indian Railways has its way, you may get to travel on the Ahmedabad-Mumbai bullet train in less than 5 years time! The Narendra Modi government has set an ambitious deadline of starting the bullet train on August 15, 2022 – the day that India marks its 75th year of Independence. On September 14, Japanese PM Shinzo Abe along with PM Narendra Modi will lay the foundation stone for this historic and gigantic infrastructure project that is going to cost India approximately Rs 1,10,000 crore. The bullet train or high-speed train project was originally scheduled to be completed in 2023, but Railway Minister Piyush Goyal has been quoted as saying that PM Modi is confident that Indian engineers will achieve the feat in lesser time. The bullet train project, which has been in works for some years now, was given the clearance by Modi government in 2015. 1. Cheaper than flights? The government, in its own words, aims to keep the bullet train ride “affordable for all”. Railways officials, quoted by PTI, have said that the fare would be comparable to that of Rajdhani Express AC-2 tier. 2. Seating capacity and frequency: Japan’s Shinkansen E5 series of bullet trains have been identified for the project. The bullet train – with executive and economy-class seats – will have 10 coaches that will be able to seat as many as 750 passengers. Later, Indian Railways proposes to add 6 more coaches to take the seating capacity to 1,250 passengers. Initially, 35 bullet trains will be operated. By 2053 this number is likely to go up to 105. The bullet trains are expected to do 70 Ahmedabad-Mumbai sorties in a day. While 24 bullet trains will be imported from Japan, the rest will be manufactured in India, reported IANS. 3. Train features: Earlier in the year, PTI had reported that Shinkansen bullet train for India will have two extra-spacious toilets for wheelchair-bound passengers, multi- purpose room for breast feeding and sick passengers, wall-mounted type urinals, baby toilet seats and western style toilets. 4. Stations: Covering a distance of 508 kilometres, the bullet train between the two business hubs of Ahmedabad and Mumbai will cover a total of 12 stations; Mumbai, Thane, Virar, Boisar, Vapi, Bilimora, Surat, Bharuch, Vadodara, Anand, Ahmedabad and Sabarmati. 5. Travel duration and speed: Two trip options will be offered by Indian Railways. With stops at limited stations – Surat and Vadodara – the train will take 2 hours 7 minutes to travel between Mumbai and Ahmedabad. However, the train that will stop at all stations will take 2 hours and 58 minutes. 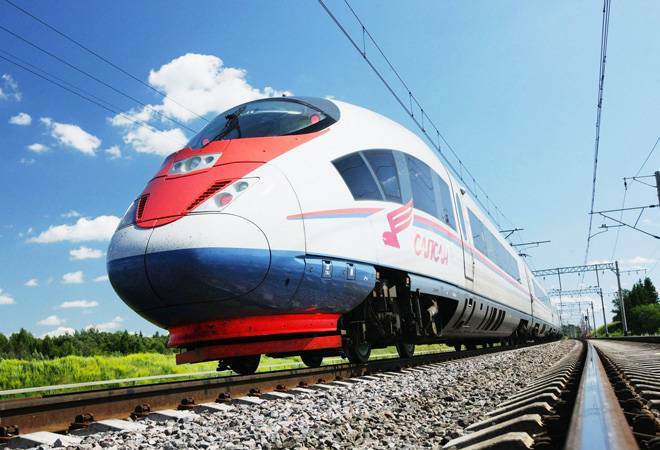 The bullet train will run at an operating speed of 320 kmph and a maximum speed of 350 kmph! 6. Under-sea tunnel: Passengers will get to travel in a 21-km long tunnel while riding the bullet train – 7km of which would be under the sea! 7. Peter not paying for Paul? That’s what Indian Railways claims. The bullet train project is being made at a cost of Rs 1,10,000 crore. Out of this, the Japanese government is providing a loan of Rs 88,000 crore at a “miniscule” interest rate of 0.1%. The loan can be repaid over a time span of 50 years, with the repayment beginning 15 years after disbursement. The loan interest ranges between Rs 7-8 crore a month and the government claims it will not put any strain on existing financial resources. “Clearly Peter is not paying for Paul,” the government claims. 8. Make in India & Transfer of Technology objectives: One of the biggest benefits of the bullet train project will come from the fact that Indian engineers and labour will gain knowledge and skills to ‘Make in India’ the parts and rolling stock. This, in turn, would be beneficial for future high-speed rail projects that are being planned for other routes in the country – and as Railway Minister Piyush Goyal said – we may even start exporting! 9. Jobs and Skill India: According to the Modi government, the project is likely to generate employment for about 20,000 workers during the construction phase. These workers will be trained specially to take up construction of such projects in India. “Some of the new areas where construction skills would be developed are ballast-less track, under sea tunnel etc,” says the government, adding that a dedicated High-Speed Rail Training Institute is being developed at Vadodara. 10. Safety: The train delay record of Shinkansen is less than a minute with zero fatality, says Japan. Not only that, the technology for disaster predictions and preventions will also be acquired. This would make sure safety is maintained in case of any natural calamity such as an earthquake etc. Modi government hopes that with this technology, India will leapfrog to the cutting edge of latest train developments. Next articleIndia starts work on bullet train project with £12bn loan from Japan Govt. This is a good start. However, authorities should plan a Mumbai – New Delhi route soon. At an operating speed of 320km/h, the distance between Mumbai and Delhi (approx 1400 km) can be covered in 4-5 hours. This would be really competitive with flying time which is currently 2 hours fifteen minutes. .
Modi’s DREAM FULFILLED. PRESENT SET up n infrastructure of INDIAN RAIWAYS is not important to MODI. VOTE bank Politics n lot of propaganda, BY IT CELL OF THE PARTY SEEMS TO DISPLAY LARGER THAN LIFE IMAGE OF HIS DREAMS.